Ruined empires of days gone by." When the governor of Isla Aether approaches you with a treasure map pointing the way to ancient ruins filled with valuable technology, it seems like an easy job. But wild beasts, rival Neobedouin treasure hunters and an Imperal Air Navy frigate are just the beginning of your troubles ... betrayal is never far away when you're a pirate! 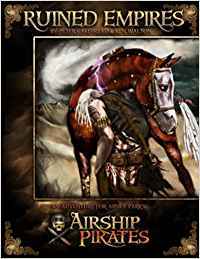 Acomplete adventure for a crew of Airship Pirates.